Caress of Steel is the third studio album by Canadian rock band Rush, released in 1975. The album showcases the band's continued evolution to hard progressive rock as opposed to the blues-based hard rock style of the band's first album. "The Necromancer: Return of the Prince"
Although Rush's previous album Fly by Night dabbled in longer conceptual pieces such as "By-Tor & the Snow Dog," such works were the central focus of Caress of Steel. Long pieces broken up into various sections and long solo passages are prominent elements of the album. It includes the band's first two epic pieces, "The Necromancer" and "The Fountain of Lamneth," which were also blamed by the record company for the commercial failure of the album itself; the latter runs 20 minutes total and comprises the entire second side of the original vinyl release. The album cover for Caress of Steel was intended to be printed in a silver color to give it a "steel" appearance. A printing error resulted in giving the album cover a copper color. The error was not corrected on subsequent printings of the album. 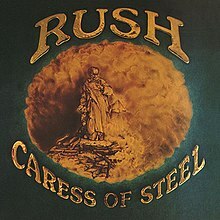 The cover artwork for Caress of Steel was designed by Hugh Syme, the first Rush album to feature his work. Syme has designed the cover artwork for every Rush album since. Geddy Lee admitted in the 2010 documentary film Rush: Beyond the Lighted Stage that he thought bandmates Alex Lifeson, Neil Peart and he were "pretty high" during the making of Caress of Steel. Some cassette printings of the album altered its intended track listing, specifically switching the "Didacts and Narpets" movement of "The Fountain of Lamneth" with "I Think I'm Going Bald" (possibly because of cassette tape length and to balance out both sides). In addition, the other movements of "The Fountain of Lamneth" are listed as separate songs. Rush's Led Zeppelin influence is still prominent on this record, most obviously in the song "Bastille Day," which discusses the storming of the Bastille in the French Revolution. An instrumental section of the song was played during the R30 Tour as part of the "R30 Overture." "I Think I'm Going Bald" was written for Canadian rocker Kim Mitchell, who at the time was frontman of the band Max Webster and a close friend of the members of Rush. According to the book Contents Under Pressure, it was also inspired by the song "Goin' Blind" by Kiss, whom Rush had frequently been an opening act for in their earlier years. Mentioned in the song "Lakeside Park," May 24 is Victoria Day, a Canadian holiday. Lakeside Park itself is a park in Port Dalhousie, St. Catharines, Ontario, where drummer and lyricist Neil Peart grew up and worked during the summer as a teenager. A necromancer is one who practices necromancy, a type of divination involving the summoning of spirits of the deceased. "The Necromancer" contains heavy influence from J.R.R. Tolkien's literary mythology; the Necromancer was an alias used by the character Sauron during the timeframe of The Hobbit. Also, in the introductory prologue to the song, the lyrics allude to "three travelers, men of Willow Dale" as the song's protagonists. This is a reference to the band itself, and an allusion to the Toronto suburb of Willowdale, where Geddy Lee and Alex Lifeson grew up and formed the first incarnation of the band. Part III of the song, titled "Return of the Prince," sees the return of the character By-Tor from the song "By-Tor and The Snow Dog" on Fly by Night; however, this time By-Tor is a hero and not a villain. "Return of the Prince" was released as a single in some countries. "[as] The hour ends the day; the author ends his work." The source of this phrase is Christopher Marlowe's play Doctor Faustus (1588). The final song on the album, "The Fountain of Lamneth," predates epics like "2112" and the Cygnus X-1 series, and is only 34 seconds shorter than "2112." It is the first epic song Rush had recorded, consisting of six parts which form a complete story about a man in search of the Fountain of Lamneth, chronicling the individual occurrences of his journey. Regarding "Didacts and Narpets" (which consists mostly of a drum solo), in the October 1991 news release from the Rush Backstage Club, Neil Peart said: "Okay, I may have answered this before, but if not, the shouted words in that song represent an argument between Our Hero and the Didacts and Narpets – teachers and parents. I honestly can't remember what the actual words were, but they took up opposite positions like: 'Work! Live! Earn! Give!' and like that." A didact is a teacher; "narpet" is an anagram of "parent". Caress of Steel has received poor reviews from professional critics. AllMusic's Greg Prato described the album as "one of Rush's more unfocused albums," while Daily Vault's Christopher Thelen called it "a tentative step for Rush, one which would lead to their masterpiece in conceptual work," in reference to the group's next album, ''2112''. Although the band initially had high hopes for the album, it sold fewer copies than Fly by Night and was considered a disappointment by the record company. The album eventually became known as one of Rush's most obscure and overlooked recordings, consequently being considered under-rated by fans. Due to poor sales, low concert attendance and overall media indifference, the 1975–76 tour supporting Caress of Steel became known by the band as the "Down the Tubes" tour. Given that and record-company pressure to record more accessible, radio-friendly material similar to their first album – something Lee, Lifeson and Peart were unwilling to do – the trio feared that the end of the group was near. Ignoring their record label's advice and vowing to "fight or fall," 2112 ultimately paved the way for lasting commercial success, despite opening with a 20-and-a-half-minute conceptual title track. Caress of Steel did not attain gold certification in the United States until December 1993, nearly two decades after its release. It remains one of the few Rush albums to not go platinum in the United States. A remaster was issued in 1997. The tray has a picture of the star with man painting (mirroring the cover art of Retrospective I) with "The Rush Remasters" printed in all capital letters just to the left. All remasters from Rush through Permanent Waves are like this. The remaster adds the album's back cover and gatefold (which included band pictures and lyrics) to the packaging which was not included on the original CD. Caress Of Steel was remastered again in 2011 by Andy VanDette for the "Sector" box sets, which re-released all of Rush's Mercury-era albums. Caress Of Steel is included in the Sector 1 set. Caress of Steel was remastered for vinyl in 2015 as a part of the official "12 Months of Rush" promotion. The high definition master prepared for this release was also made available for purchase in 24-bit/96 kHz and 24-bit/192 kHz formats, at several high-resolution audio online music stores. These masters have significantly less dynamic range compression than the 1997 remasters and the "Sector" remasters by Andy VanDette. All lyrics written by Neil Peart; all music composed by Alex Lifeson and Geddy Lee except where noted. III. Return of the Prince – 3:51"
VI. The Fountain – 3:50"
^ Wagner, Jeff; Steven Wilson (2010). Mean Deviation: Four Decades of Progressive Heavy Metal. Brooklyn, New York: Bazillion Points. p. 23. ISBN 0-9796163-3-6. ^ Chaney, Jen. "A Rush documentary filled with 'The Spirit of Radio'". WashingtonPost. Retrieved February 15, 2010. ^ Prato, Greg. Caress of Steel – Rush at AllMusic. Retrieved 30 May 2012. ^ "Rush: Album Guide". Rolling Stone. Retrieved February 21, 2013. ^ Thelen, Christopher (July 8, 2001). "Caress Of Steel – Rush – Mercury, 1975". The Daily Vault. Retrieved July 31, 2012. ^ "Caress of Steel - Rush | Songs, Reviews, Credits | AllMusic". AllMusic. Retrieved February 20, 2017. ^ "Rush: Caress Of Steel | Daily Vault". dailyvault.com. Retrieved February 20, 2017. ^ a b Wagner, Jeff; Steven Wilson (2010). Mean Deviation: Four Decades of Progressive Heavy Metal. Brooklyn, New York: Bazillion Points. p. 24. ISBN 0-9796163-3-6. ^ "RIAA Database Search for Rush". Recording Industry Association of America. Archived from the original on June 26, 2007. Retrieved January 29, 2012. ^ "Andy VanDette On Remastering 15 Rush Albums". The Masterdisk Record. November 23, 2011. Archived from the original on August 23, 2014. Retrieved April 22, 2014. ^ "12 MONTHS OF RUSH: 14 ALBUMS FROM MERCURY ERA FOR RELEASE IN 2015". Rush.com. Retrieved July 10, 2015. ^ "Rush – new 2015 vinyl and hi-res reissues thread". Steve Hoffman Music Forums. Retrieved July 10, 2015. ^ "Recording Industry Association of America". RIAA. Archived from the original on October 17, 2015. Retrieved August 17, 2011. ^ "Gold Platinum Database". Archived from the original on March 29, 2014. Retrieved April 22, 2014.